One of the best things about having your rubbish clearance in Stockwell done by the experts is the fact that you can do other things in the meantime. Having a clearance in Stockwell done yourself is very taxing and time consuming especially when it comes down to moving offices. There are a million and one things to be done when you are switching to a new location and the last thing you want is your SW8 waste clearance being an unnecessary headache. Go Rubbish Go can provide help with such issues in SW8, and our range of services includes garden waste disposal SW8, flat clearance and rubbish removal as well. With late opening hours, we can deliver exceptional service when you need us most! For more information, call us now on 020 8610 9182 and speak to one of our team members to obtain a free estimate. We will walk you through all our services available and help you choose the most suitable ones for you. Office clearance in Stockwell is a major job, it isn’t for the faint hearted. 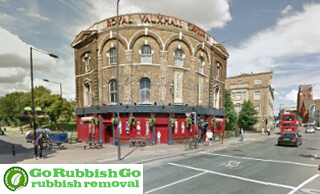 Go Rubbish Go will always serve you, even upon last-minute requests, which is something that we are aware most other Stockwell SW8 rubbish removal companies won’t do. When you are decluttering, old furniture and heavy junk items aren’t things that you can dispose of by yourself or even with your staff. The reason for this is that people don’t always know how to lift heavy items properly and can risk injuring themselves badly. When you hire out SW9 based clearance team, you can rest easy in knowing that all that is taken care of and all your excess belongings will be cleared out swiftly and with precision. Got a few quotes for rubbish removal services in Stockwell from different companies, but this firm had not only the best prices, but the most reliable reputation in SW8 too, and that combination convinced me to hire them. I don’t regret my choice; they were superb in every way! Thank you! Besides offering commercial clearance services, we also offer other services such as waste collection in SW8 as well as garage clearance. It is amazing how things can pile up so quickly, without you noticing them and this is where we step in to help! Hiring an office clearance team ensures that you don’t have to spend countless hours trying to put everything in place – we will do it for you. All you need to do is sort out the paperwork and tell us what needs to be cleared out. Call us on 020 8610 9182 today to see how we can help you. Alternatively, visit our website to receive an instant quote and book online! Has your house just undergone a renovation that has left it in a tip? Perhaps you have a load of builder’s rubble left over from a recent job, or maybe your house is in need of a bit of a clear out? Whatever the situation may be, we are here to help. 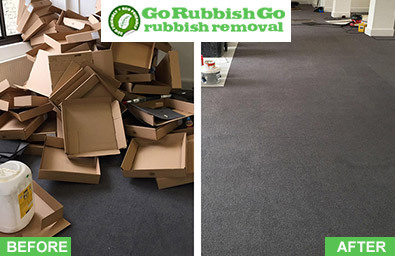 At Go Rubbish Go, we have been providing people with quality SW8 rubbish disposal Stockwell services for many years. We guarantee you to clear away your mess and free up some extra space. Hire our waste clearance services and enjoy a clutter-free home! Stockwell, based in the London Borough of Lambeth, is typically known colloquially as Little Portugal, due to the number of Portuguese residents in the area. It is also home to a lot of people of Afro-Caribbean and West Indian descent. The area is very well served by transport links including night buses and the Underground on both the Victoria and the Northern line. The nearest areas are Brixton, Clapham, Vauxhall, and Battersea. Stockwell is known as one of the most socially deprived areas of London and many people in the area rely on social housing for residence. It was a rural manor on the edge of London before the boundaries were changed in 1867, making it a part of Inner South London. It has the postcodes of SW9 and SW8. A notable place is the John Charles De Menezes Memorial.